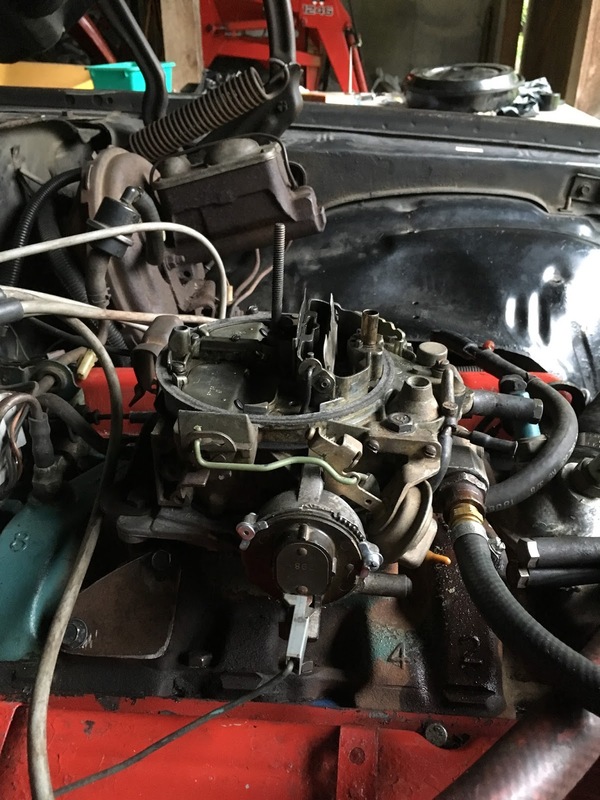 1980 Camaro, with the 305, will run at idle but will bog down when press on gas. When full throttle is applied slowly, it will stay running initially, but will bog way down to very rough idle. It makes this sucking sound like it is starving for air. Also, when the car is in gear and driving it will stall unexpectedly. I've rebuilt the 4bbl, tested for compression, retimed it correctly, taken the intake manifold off and resealed it, plugged all vacuum lines not in use, checked fuel pump pressure. The fuel tank, lines and fuel pump are 1-2 years old. Electric choke is ok and initial timing is set to 6 degrees BTDC. Still have PCV valve and snorkel. Smog pump, EGR valve, and most of other emissions stuff was removed. Carb is 1980 Rochester Quadrajet 4MV Number: 17080202. Seems to be the original when the car was produced. When I put away last fall it was running perfectly. It was parked under a barn but with no heat. I'm at a loss. 1. This is the most clearly described question I've seen posted online in pretty much ever. Clear, well-focused photo, HD video with good audio, everything! It's wonderful and refreshing. Keep it up! 2. I see two likely possibilities: it's not getting enough fuel, or there's not enough vacuum. I know you said you plugged all of the unused vacuum ports, but have you put a gauge on it to make sure that it makes and holds vacuum? Regarding the fuel possibility: Do you have a fuel pressure gauge? Are the bowls filling up? Could the jets be clogged? You probably already thought of this, but just in case, is it possible the spring on the secondaries is weak and they are opening prematurely? Couldn't see in the video. Last edited by Injuneer; 07-16-2017 at 04:30 PM. Couldn't have been too important - posted, immediately signed off, and never signed in again. How rude .Then why waste our time. Unfortunately, it's happening more and more on this site. Even though he's probably not coming back, do you think this could possibly be a clogged fuel filter? Or does good fuel pressure mean that the fuel filter wouldn't be the problem?